A classic dome version of the 6mm Vitalium band. 6mm is the perfect width for those desiring something easier and less noticeable to wear. 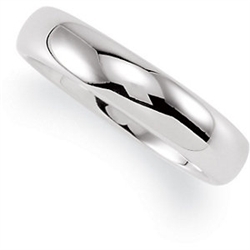 Why Vitalium for wedding rings? Vitalium rings will never oxidize, can be easily removed, and are brilliantly white. They are also 2x as hard as cobalt rings.